Rome has a lot to offer : See our sightseeing tours and discover the monuments and places of interest in Rome. See Sistine Chapel, Coliseum, Vatican... Enjoy a romantic dinner cruise or a Night walking tour. 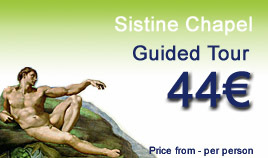 We propose 50 tours in Rome : Romantic dinner cruise, Rome at night, a coliseum guided tour, Sistine Chapel guided visit. All places to see and things to do in Rome.